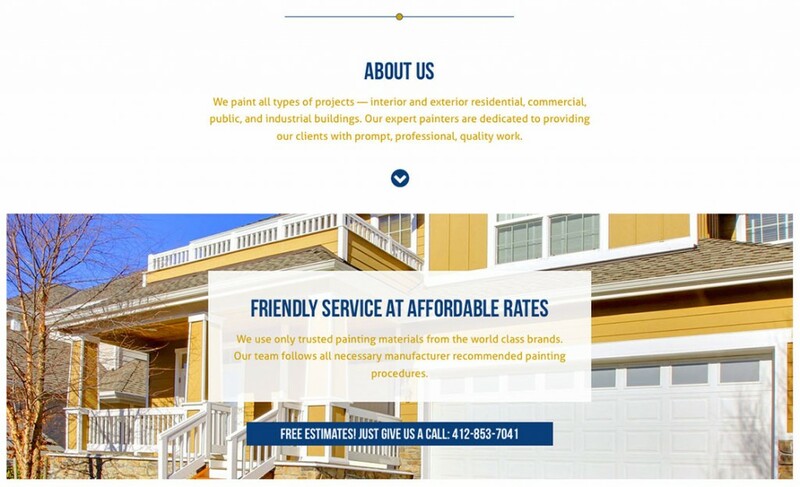 Golden Brush Painting is an experienced Pittsburgh Residential and Commercial painting, drywall and pressure washing service. 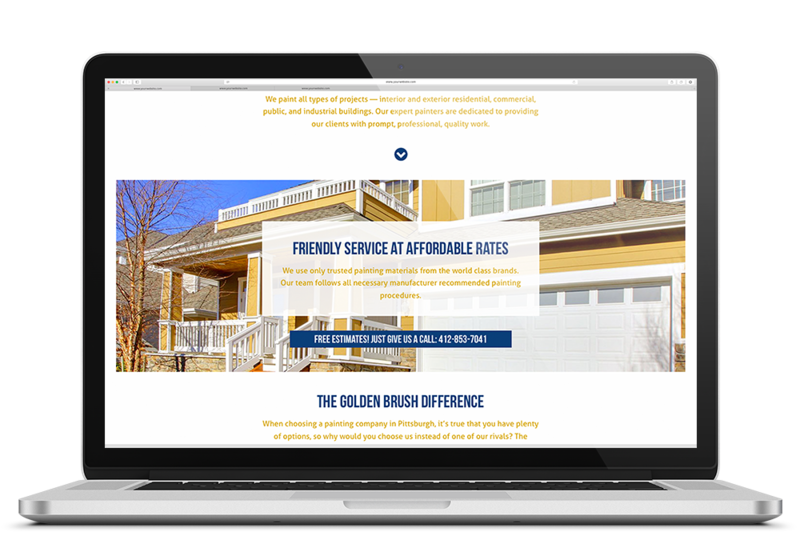 They’ve been operating with traditional marketing and media and decided to launch a single-page website to direct their potential customers to call in for free estimates. Provided with a generous amount of content and a few photographs of their work, I decided to go in a traditional and minimalist style. 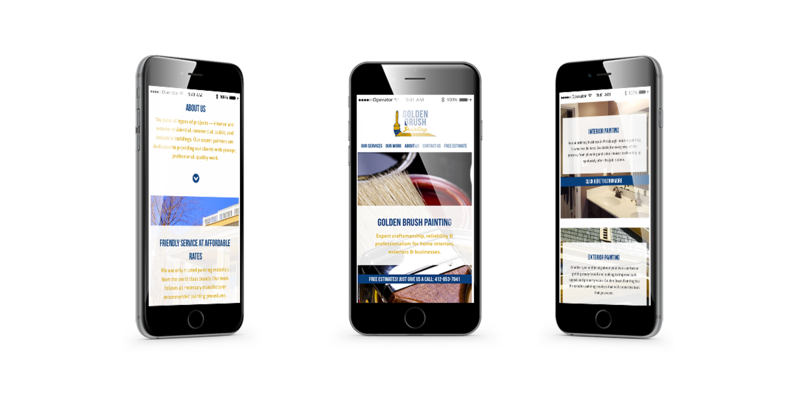 This project required an excellent mobile experience as many of Golden Brush Painting’s customers are likely to be looking at the site on their mobile devices. Peppered throughout the one page site are call outs for customers to dial in for an estimate, clicking on any one of these call outs prompts the user to call in. White space is used generously, punctuated by brand colors that represent Golden Brush Painting’s extensive experience and offered services, ensuring mobile users have plenty of space to navigate the entirety of the content-rich site. Golden Brush Painting predicted many of its users would be landing on the site from a mobile device–notably smartphones. So I took an approach that ensured mobile users would get a pleasant browsing experience with jump points throughout the design. A fixed heading was toyed with and eventually scrapped in favor of directional arrows as a means to encourage more scrolling and less skipping around. The website, on a desktop, is tall and the best way to view it is through its live link. Golden Brush Painting initially had a logo utilizing a bright yellow. I decided to tone it down a little, making the yellow more of a gold to match their corporate name. The addition of blue as a color foil helped to create a high-contrast, visually striking balance that worked well with the photography I was provided. Coupling the gold and blue scheme with a typography pairing of Bebas and Aller, the result is a modern, clean and attention-grabbing design. The website for Golden Brush Painting is live as of February 24, 2016. It features a visual composer for easy maintenance without having to know code and a simple WordPress backed CMS for expandability. 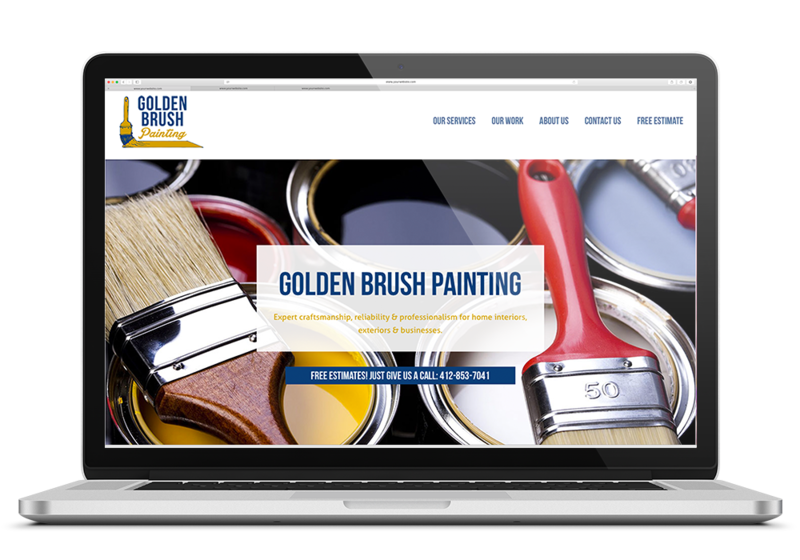 We’re hoping with this site, Golden Brush Painting has a great new marketing tool to attract more clients online. If you’re looking for a great home or business painter, Golden Brush Painting is the one to check out.